Meet France, a tiny and adorable home that can snap together almost anywhere in as little as three hours. Designed by architect Joshua Woodsman of Pin-Up Houses, the prefabricated tiny house was constructed for just $1,200 and assembled by three builders. 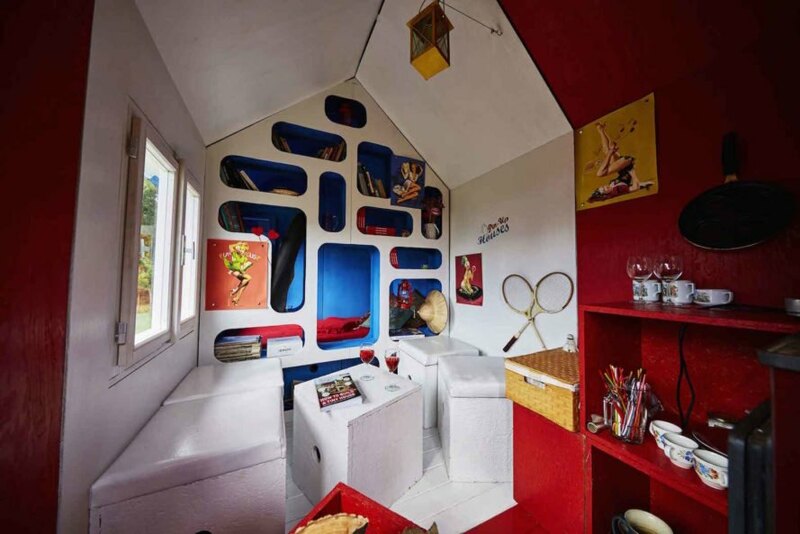 The experimental prototype was painted red, blue, and white to mimic the French flag and was created as part of Woodsman’s ongoing research into the feasibility of mass-produced prefabricated tiny homes. Despite its patriotic coloration and name, Tiny House France was assembled in the Czech Republic just south of Prague. The structure was built from 21 insulated panels connected with threaded rods. This setup makes it easy to assemble and disassemble the home as needed. The house is topped with a classic gabled roof and is elevated off the ground, no foundation necessary. The house is split into three main spaces partitioned by color. The section painted blue houses the bedroom and “night zone”, a decision motivated by the architect’s belief that the color blue “is the most suitable for a good night’s sleep.” The communal area with multifunctional seating and a table are located in the white-colored “day zone” and divided from the bedroom by a multifunctional partition that doubles as shelving. The final red-colored “heating zone” contains the wood-burning stove and kitchenette. Where can these pin up houses be purchased? Despite its patriotic coloration and name, Tiny House France was assembled in the Czech Republic just south of Prague. The structure was built from 21 insulated panels connected with threaded rods. This setup makes it easy to assemble and disassemble the home as needed. The house is topped with a classic gabled roof and is elevated off the ground, no foundation necessary. The house is split into three main spaces partitioned by color. The communal area with multifunctional seating and a table are located in the white-colored “day zone” and divided from the bedroom by a multifunctional partition that doubles as shelving. The final red-colored “heating zone” contains the wood-burning stove and kitchenette.